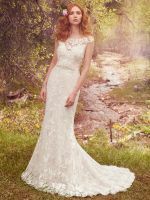 Beautiful petite, curvy, full-figured styles for brides of all ages, BoHo (Bohemian) gowns, LDS (Latter Day Saints / Mormons) gowns, destination weddings, barn weddings, and other venues. All gowns in stock and available for immediate shipment. 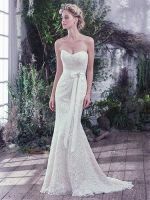 Maggie Sottero gowns bring back all things feminine: ribbon belts jeweled with sparkling embellishments, hourglass silhouettes designed to flatter a woman's curves, and illusion lace necklines, cap sleeves and bodices to entice and intrigue. Skirts vary from grand whimsical tulle and organza ball gowns to the chic sophistication of slim A-line chiffons. Also prominent in the collection are voluminous skirts crafted from soft folds of fabric, cascading layers, and billowing caught up details. Hemlines range from traditional full length flowing gowns to the modern short bridal gown. The options are abundant, each beautifully and thoughtfully designed, intended to make dreams a reality for every Maggie Bride. Be sure to visit Pizazz Wedding Boutique to get your authentic Maggie Sottero wedding gown. 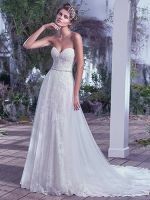 You deserve the highest quality for your special day and you will appreciate the quality that goes into every true Maggie Sottero gown as you celebrate.